You will be given a reference e-book to read which has 350 pages And the test will be based on that e-book , you can take final test within 1 year of purchase. Volleyball refers to a team sport wherein two opposing teams composed of six players are separated with the help of a net. The scoring system requires the players of each team to score points by grounding the ball on the court of the opposing team while following the organized rules for the sport. Although volleyball comes with extensive rules, you have to bear in mind that the entire sport is simple. One of the players of any team starts the game by rallying or serving the ball and tossing and hitting it using one arm or hand from the back portion of the court’s boundary line over the net into the court of the receiving team. The team which is responsible in receiving the ball should not allow it to touch the ground. Volleyball is also considered as a game which combines athleticism and leaping ability with technique and power. These are extremely vital to improving your skills in the game along with your willingness to become part of a volleyball team and sacrifice your body. In order for you to effectively play volleyball, you need to familiarize yourself and practice the strategies and techniques needed for the sport. You need to start mastering the techniques involved in serving, passing, setting and attacking. 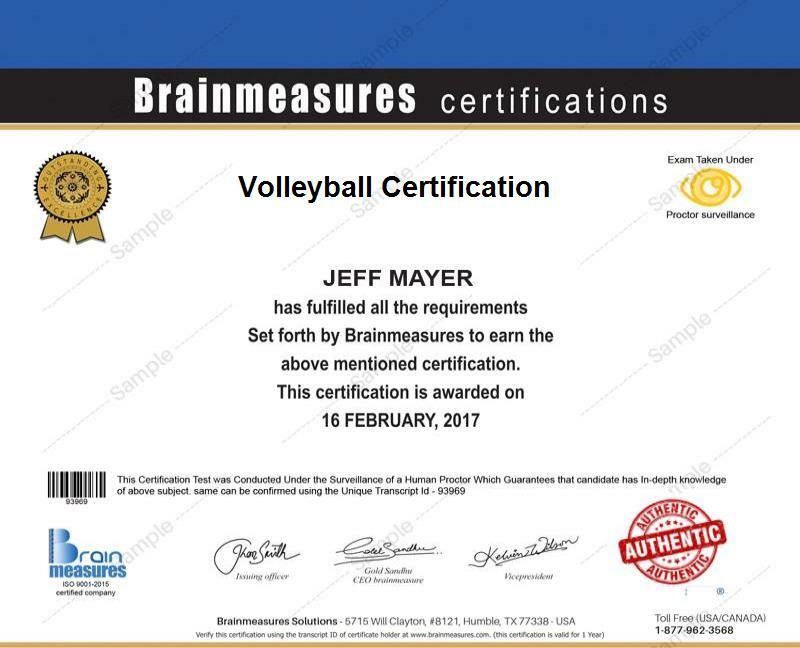 Mastering volleyball is now greatly possible with the volleyball certification program which is now offered by Brainmeasures. The volleyball course offered by Brainmeasures allows you to embrace everything that you need to learn about the sport including its history and most vital concepts. This online certification course gives you the opportunity to receive a well-detailed volleyball training so fully understanding the rules and mechanics of the game as well as all the techniques that you can use once the game starts is greatly possible. The volleyball certification program also walks you through the field of volleyball coaching so your desire to become a certified volleyball coach can be easily reached. As soon as you complete the certification course, Brainmeasures will reward you with your volleyball certificate which serves as a clear indication of your skills and expertise in this type of sport. The volleyball certification course which is now available at Brainmeasures benefits anyone who aspires to become an effective and successful volleyball player. It is more beneficial for you especially if you are planning to master the sport and become a certified volleyball coach. The certification course makes it easier for you to handle all the challenges linked to coaching a volleyball team so you can expect to thrive in the industry after completing the certification course. Volleyball players and coaches who have successfully completed their volleyball certification course can take part in the game in both amateur and professional level and enjoy a more stable salary along the process. Your volleyball certification allows you to become a professional volleyball player and earn around $69,000 annually. Working as a volleyball coach is also proven to be extremely profitable considering the fact that it allows you to earn within the range of $42,000 and $109,000 per year.